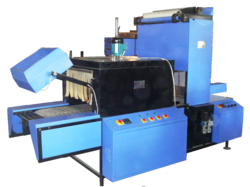 Pioneers in the industry, we offer sleeve wrapper machine and shrink wrapping machine from India. These model machines are custom made system for packaging of products with thick shrink films with all sides sealing. 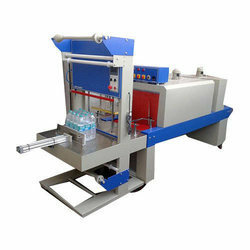 The machine is an automatic machine in process, with automatic conveying of the product, sealing, and heat shrinkage. The product to be packed will be sealed in first wrapping unit, and then advance to second stage where the side of the pack will be sealed. These units are designed upon the size and quality item and the requirement of the customer. The system is suitable for either for independent use or can be utilized in automated production line. The Very efficient machine, all around close design ensures less heat loss thus less electricity consumption. The heavy-duty conveyor system, which is having insulated surface to avoid any damage to product or shrink sleeve. High-speed blower system with a continuous rating. High-quality heating element. The machine can be attached to any other packing machine or operation to give online application. Other sizes are available as per requirements.